HomeArchaeologyDo the Glozel Runes Conceal the Secrets of Our Prehistory? In March 2010, Émile Fradin, a modest peasant farmer from central France, died at the age of 103. To his grave he took the secret behind one of the most controversial archaeological discoveries of the 20th century. 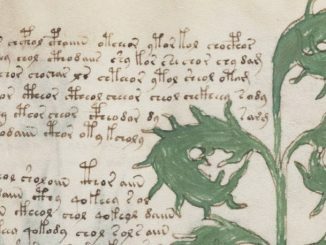 A discovery which put into question the very origins of the written word and the paternity of European culture.1Genzmer, Herbert and Hellenbrand, Ulrich. Myths and Mysteries of the World: Unexplained Wonders and Mysterious Phenomena. 2007. pp.76-77. ; Émile Fradin obituary. The Telegraph. 4 March 2010. Retrieved 06/04/2017. ; Émile Fradin obituary. Le Monde. 27 February 2010. Retrieved 06/04/2017 It was the uncovering of peculiar artefacts would come to be known as the Glozel runes. On the first day of March 1924, a not yet 18-year-old Fradin was ploughing his family’s field in the hamlet of Glozel, when his cow stumbled into a hole. When he and his grandfather, Claude, looked closer, they discovered a mass of broken stone, under which lay an underground chamber. 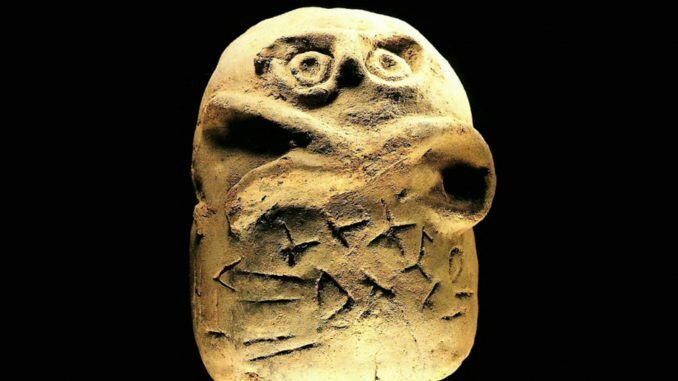 Within, they discovered pottery fragments, carved bones, and a peculiar clay tablet covered in bizarre characters that neither of the two could decipher. 2Genzmer, Herbert and Hellenbrand, Ulrich. Myths and Mysteries of the World: Unexplained Wonders and Mysterious Phenomena. 2007. pp.76-77. The family requested a subsidy for excavation works to be carried out, but were refused by the regional authority.3Musée de Glozel website. Retrieved 06/04/2017. With that disappointment, it seemed as though the discovery would fade into obscurity. However, the following year, news of Fradin’s unusual clay tablet reached the ears of the physician and amateur archeologist, Antonin Morlet. 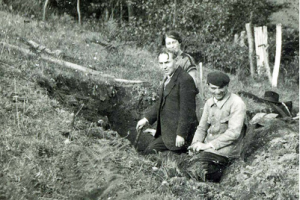 By the end of May 1925, Morlet began the first of his excavations.4Musée de Glozel website. Retrieved 06/04/2017. Within the first two years alone, he had amassed some 3,000 finds.5Émile Fradin obituary. The Telegraph. 4 March 2010. Retrieved 06/04/2017. Unimaginable wonders continued to pour from the earth: further runes inscribed in the same strange characters; arrowheads and shafts carved in bone; rings bearing cabalistic symbols; human bones; and hermaphrodite idols. All in all, some 100 tablets bearing inscriptions were claimed to be unearthed at Glozel. The meaning and origin of these inscriptions still remained elusive.6Émile Fradin obituary. The Telegraph. 4 March 2010. Retrieved 06/04/2017. ; Genzmer, Herbert and Hellenbrand, Ulrich. Myths and Mysteries of the World: Unexplained Wonders and Mysterious Phenomena. 2007. pp.76-77. Initially, the site was thought to have been Gallo-Roman. However, the nature of some of the artefacts uncovered suggested a far older provenance. Representations of reindeer were engraved on some of the objects. 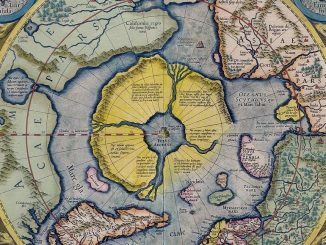 As such creatures had long been extinct in the area, Morlet proposed that the site could date back anything up to 17,000 years. If true, what was being proposed would revolutionise archaeological knowledge. In September 1925, Morlet published a report of his findings, crediting the young Émile Fradin as his co-author. 7Émile Fradin obituary. The Telegraph. 4 March 2010. Retrieved 06/04/2017. Images sourced from Glozel Recherche. The French archaeological academia was instantly dismissive of Morlet’s report, the mere creation of an amateur and a peasant boy. It was not until the next year, when a number of distinguished archaeologists were invited to visit the site, that the discoveries at Glozel began to receive support. Museum curators, members of scientific academies and the famous archaeologist Abbé Henri Breuil, nicknamed “the pope of prehistory”, conducted their own excavations and were impressed. However, the tone of the debate soon changed. Accusations of a hoax began to circulate. Abbé Henri Breuil changed his summation of Glozel from a “sensational find” to an outright forgery. Writing in October 1927, he stated that, “Everything is false except the stoneware pottery”.8Émile Fradin obituary. The Telegraph. 4 March 2010. Retrieved 06/04/2017. At this point, the Glozel discovery exploded into controversy. The archaeological academia was divided. Was the entire site fraudulent: the invention of a bored, barely-literate peasant boy? Or, did the finds at Glozel represent the rewriting of history as we know it? Certainly, some learned men, including leading archaeologist and epigraphists, began to speculate that the discovered tablets suggested that the earliest writing had originated, not around 3300BC in the Middle East, but around Glozel several millennia earlier.9Émile Fradin obituary. The Telegraph. 4 March 2010. Retrieved 06/04/2017. Other theories included the site being a witches’ lair. The indecipherable alphabet, perhaps, an occult language.10“Glozel, l’année 1926”. Musée de Glozel website. Retrieved 06/04/2017. Experts were confounded, and could not agree upon an explanation. An anthropological commission was appointed to assess the site’s authenticity. After a three-day excavation, they published a report that condemned the discoveries, with the exception of a few pieces of flint axes and stone, as fake. What followed was a legal-academic war. Fradin filed a suit of defamation against a curator at the Louvre. The president of the French Prehistoric Society filed a complaint of fraud against Fradin. A further committee was sent to investigate the site. This time, its authenticity was confirmed, with the conclusion being drawn that the site dated back to the Neolithic period. Yet, confusingly, the chief of the Criminal Records Office in Paris – after raiding the site and confiscating many of the artefacts – damned the whole affair as a forgery. Ultimately, the law would side with Fradin and Morlet: the complaint of fraud was overturned, and the curator at the Louvre was found guilty of defamation. 11“Tribunal correctionnel de la Seine”. Musée de Glozel website. Retrieved 06/04/2017. Legally exonerated, Fradin returned to his farm, where he would tend a museum housing many of the discovered artefacts until the day he died. Morlet continued excavations at the site until 1938. The Second World War and a change to French law making any further excavations after that point impossible.12Émile Fradin obituary. The Telegraph. 4 March 2010. Retrieved 06/04/2017. ; Genzmer, Herbert and Hellenbrand, Ulrich. Myths and Mysteries of the World: Unexplained Wonders and Mysterious Phenomena. 2007. pp.76-77. What does modern science say about the Glozel runes? In the 1970s, discussion as to the validity of the runes flared up anew. Since that time, various samples have been re-examined, this time with the aid of modern science, carbon dating and thermoluminescence. Determined to be the oldest find, was a bone plate from 17,000 years ago. Further bones dated back 15,000 years. The mysterious tablets, however, were found to be considerably later, having been fired around 600 BC. Regardless of this, there are still those who claim that it is possible that additional tablets once existed, and are now lost to us. 13Genzmer, Herbert and Hellenbrand, Ulrich. Myths and Mysteries of the World: Unexplained Wonders and Mysterious Phenomena. 2007. pp.76-77. Claims have been made that similar tablets have been found in China, with characters that are almost, if not entirely, identical, to those found at Glozel. These tablets were found in the ruins of a prehistoric village which some have estimated to be 8,000 years old. Another instance is the supposed findings of yet more similar characters in Australia. 14Genzmer, Herbert and Hellenbrand, Ulrich. Myths and Mysteries of the World: Unexplained Wonders and Mysterious Phenomena. 2007. pp.76-77. Attempts to decode the peculiar alphabet continues into the present day. 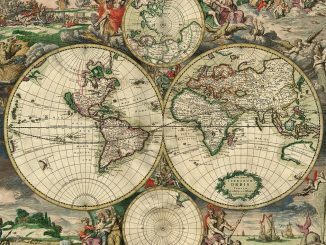 Scholars from across the globe have presented various possible linguistic origins, from Semitic, to Sumerian, to Basque, to proto-Turkic, to Celtic, to Iberian, and so on . No one has thus far been able to agree on a conclusion.15”Traduction”. Musée de Glozel website. Retrieved 06/04/2017. Many retain the belief that the runes conceal secrets of our prehistory. 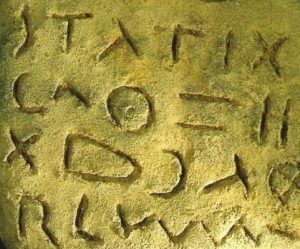 With Émile Fradin’s death in 2010, it seems as though we may never know the truth about the Glozel runes.